Late payments are still causing cash flow problems for UK SMEs. An email just received from one of our new funding partners, My Muse, was headed "48% of SMEs impacted by late payments". It goes on to quote some recent Dun & Bradstreet research that has revealed that the average amount owed in late payments has increased by almost 25% over the last year to an average of over £80K. Within this average there are some 17% that are owed between £100K and £500K, significant sums of money, that would cause cash flow pressures for most businesses. The impact of these late payments can be cash flow difficulties, delayed payments to the SME's own suppliers and ceasing to supply late paying customers. 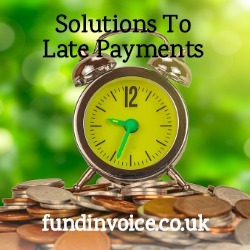 If your customers are paying your invoices late, there are several solutions to late payments that you might want to consider. Many UK businesses use credit from their suppliers to finance their own businesses. If you don't have to pay your suppliers, you don't need to borrow so much. In this way, you could be providing a quasi overdraft to your customer base if they are not paying on time. Do you have adequate credit control procedures in place? If you don't, the lack of a timely phone call, statement or chasing letter could be all that is needed to ensure that you are paid quicker. For help structuring your own credit control function, please see our free guide to credit control. If you don't want to operate the credit control function in house, you could look at outsourcing the function to a professional credit control company. In many cases, they will be able to improve on the debt turn that you are achieving, as they tend to use professional credit controllers and a robust chasing process. We have successfully used external services to benefit some of our clients. The quicker you get paid, the less you need to borrow. If you are already doing everything you feel that you can on the credit control front, there are financial products that will bridge the credit gap for you, providing a late payment solution. That is the time between raising your sales invoices, and your debtors making payment to you. Even if they are not technically late payments i.e. they are paying to terms, there are products that will enable you to receive part, or all of the value of your invoices up front - immediately you raise them. These services are called invoice finance or receivables finance and our survey of existing users found that 96% of them thought that greater use of invoice finance would improve the UK's late payment culture. If you need help please call Sean on 03330 113622 for help finding solutions to late payment.